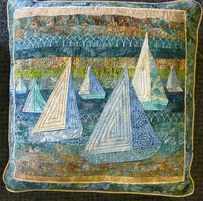 Chester Patchworkers and Quilters (Ps & Qs) is a group of over 80 members who enjoy patchwork and quilting. Some members are new to the craft and other members of the group are very experienced so we have a wide range of ability. However, we are all passionate about fabric and creating items of interest and beauty, so we hope that all members can gain confidence in being with like-minded folk to enjoy and develop their skills. Our regular evening meetings are held on the 3rd Wednesday of the month - except August and start at 7.30 pm. We usually meet at Upton Village Hall except in March, when we meet in Burley Hall in Waverton so please check the location in the programme before leaving home. Both halls have a loop system for the hard of hearing. The hall is open from 7-15pm so that we can browse and purchase fabrics and notions before the meeting from our traders, Dot Sherlock and Marion Barlow. There is a varied programme of activities including talks, workshops and project evenings where we share knowledge and techniques as well as develop practical skills. One of the highlights of most of our meetings is the ‘Show and Tell’ session when members have an opportunity to show their finished projects or works in progress so that we can all get pleasure and inspiration from their efforts. We have a few sewing days through the year where we work on our own unfinished projects (UFO days) and we sometimes put on exhibitions and displays to promote our patchwork and quilting. 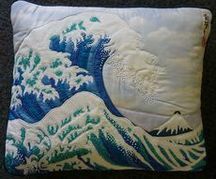 New members are always welcome so please come along to one of our meetings - there will be a small charge but you will enjoy a warm reception and see some exciting quilts and patchwork related items. We hope that you will like what you see on this website, catch our enthusiasm for patchwork and quilting and, join our group. Please get in touch if you would like to borrow our suitcase collection.